You are at:Home»Hot Toys»Action Figures»The Return of M.A.S.K. GI Joe was my action toy of choice growing, followed closing by Transformers and then everything else. We saw a lot of weird-yet-cool toys come out of the 1980s, mostly thanks to the onslaught of cartoons-to-sell-toys on television. One of those was called M.A.S.K. and was a combination of GI Joe and Transformers. Honestly, that’s a great idea but I thought the cartoon lacked GI Joe’s well-written stories and the toys were a little on the small. How great it is then that it sounds like M.A.S.K. is coming back? I wasn’t a huge M.A.S.K. fan so I’m almost indifferent but it’s still kind of cool to see another slice of my childhood get reborn. And this time, I don’t really care what they do with it. It already sounds like Hasbro is trying to integrate M.A.S.K. into the next GI Joe movie, which makes some sense. Should a standalone M.A.S.K. movie get made, I’m sure it would be worthy of Michael Bay-like treatment…big explosions and things that transform. Whereas Transformers changed between vehicles and living robots, M.A.S.K. just went with the transforming vehicles. No robots. I only had one M.A.S.K. 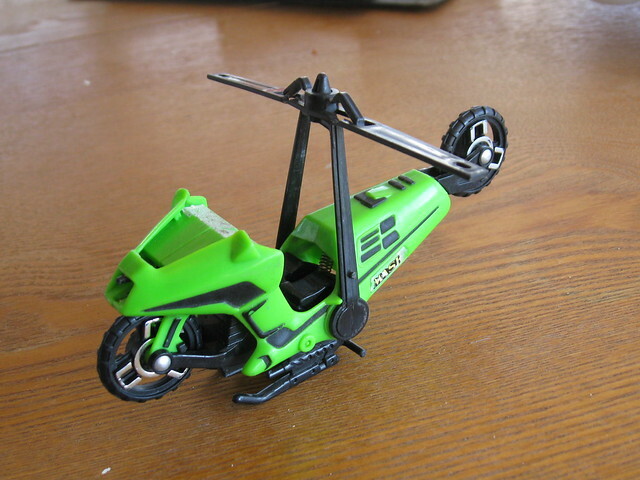 toy, a green motorcycle that turned into a helicopter called Condor. I found that toy not long ago while going through some boxes. I don’t have the action figure anymore but the vehicle is in not too bad shape, shy of a few missing stickers. I remember the M.A.S.K. action figures were very small and kind of bendy. They were limited in articulation and really didn’t lend themselves to much. I recall using my M.A.S.K. figure as some sort of mutant when playing with GI Joes. While he usually died quick, his short stature gave him the ability to sneak into bases and plant bombs…so not a total red shirt. Condor in motorcycle form. Actually, a pretty cool looking bike. 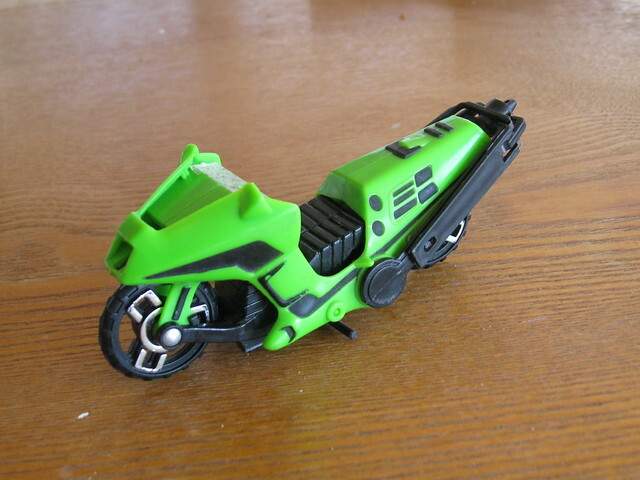 One of the M.A.S.K. vehicles was a Trans-Am sports car that turned into a jet called Thunderhawk. It was a bigger a toy and I think one of the flagship toys for the franchise. I liked it mostly because the doors went up like on a DeLorean car, which in the mid-1980s was a cool as you could get (actually, make that “rad”). Maybe because M.A.S.K. isn’t a well-remembered sacred cow like GI Joe or Transformers, it could be a sleeper franchise that finally grabs hold. Although I still think this era of new Transformers it will be hard for the them to differentiate themselves. So here’s a crazy idea…take a page out of the Marvel handbook and integrate Transformers, GI Joe and Mask all in one. Here’s my pitch: Transformers are on Earth and the government doesn’t like them. GI Joe is the most elite team of military folks on the planet, they can do anything…almost. They try to take out the Transformers but fail. But by luck, they figure out the Transformer technology and are able to apply it to normal cars, trucks and planes…but without the need for all the autonomous robot stuff…and thus M.A.S.K. is born! The job of M.A.S.K. is to fight the Transformers, chaos ensues and toy sales go through the roof.